We take a look at the restaurants that are top of Tripadvisor’s Ibiza leader-board. By nature of the exercise it is unlikely anybody will agree totally with the selection, and most of us will have our personal favourites we think have been cheated in not being included. 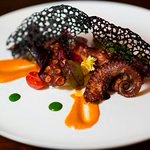 But putting aside those not on the list for a moment, those that are included go to make quite some showcase of Ibiza’s rich culinary offering. A surprise perhaps that Playa d’en Bossa would claim the highest representation with 4 of the top 10 spots. Ibiza Town and San Antonio have two apiece, with San An’s Tapas Restaurant and Lounge Bar also having by far the highest number of reviews at just under 1,400. With the final two spots taken by San Rafael and Santa Eulalia it leaves the entire North of the Island and all of its Southern Beaches without representation. One common thread throughout the list, all are independent restaurants and none of the big billboard names in Ibiza make it to the top ten. Perhaps it is the passion of the patrons that comes shining through? For each listing we have shown their total number of Tripadvisor reviews, along with a rough ratio of what languages they were written in, thereby an indication of their clientele. La Cabana first opened its doors in 1973. 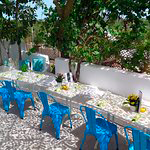 Tucked away in the backstreets of Playa den Bossa, it is an unassuming building and location, perhaps not where you would expect to find Ibiza’s number one restaurant, but as one recent reviewer said “we’d put this in the category of crawling through broken glass to eat there”. La Cabana serves a Mediterranean inspired tapas menu with an extensive cocktail range. Bebel is nestled at the foot of La D’alt Vila. 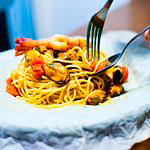 Italian seafood is their style, though at pains to point out they use the very best locally caught Ibicenco fish. The decor and friendly service are regular among the positive comments. Ajo Blanco describes itself as a ‘vermutería, like those of yesteryear’. We’ll be honest and say nobody in the office knew what a vermuteria was, but Google to the rescue and we now know it to be a traditional bar, often very small, that specialises in Vermouth alongside an array of seafood pintxos and salty snacks. In its modern incarnation the menu has extended somewhat, and with their number 4 spot perhaps we’ll see more vermuterias appearing soon. 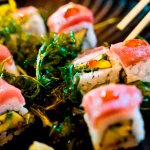 The only Sushi, or for that matter only Asian, restaurant to make the top 10, Sushimi has been a big hit since opening. ‘International flavours, served in the Spanish Tapas style’. It seems to be a winning formula as the Tapas terrace is a ‘must book’ throughout the height of the summer season. 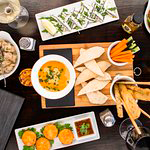 Their internationalism is reflected in menus being available in 5 langauges, and the most diverse list of Tripadvisor reviewers, with praise coming in from all corners of the globe. Tapas have by far the highest number of reviews on the list, and if there is any truth to the common held belief that the more reviews you get the harder it is to stay at the top, they must be doing very well indeed. 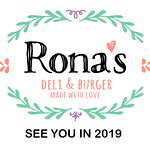 Rona’s Deli are one of many in the top ten who have focussed on healthy eating and dietary expectations as an integral part of their business model. They take it further than most with a 100% commitment to local and organic produce. “We believe that you don’t have to decide between soul food and super food. All of our sinfully tasty dishes are homemade with love and passion. 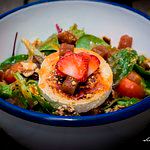 We are dedicated to serve you the best food for your health and soul using only organic, fresh, healthy ingredients from local farmers and butchers. Ohana is something of a mystery. We know where it is, a great spot right on the seafront in Playa den Bossa but away from its hedonistic heart. 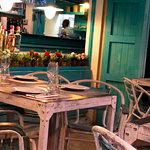 It describes itself as a Tapas restaurant, though the reviews talking of plates and paellas show it to be something more. But beyond that there seems very little. It has no website, and its facebook page has some photos and one post from May 2018. Perhaps the biggest surprise for a seafood and Tapas restaurant is the very small number of Spanish reviews, just 30 of its impressive 904. 35% Spanish, 30% Italian, 30% English. 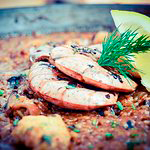 Reflecting our introductory comments about the patrons’ part in what it takes to get to the top of the list, BlueFish is in the heart of Santa Eulalia’s restaurant street run by owners Alex and Patricia. Their commitment to locally sourced and high quality produce ticks more of the boxes, and reviewers often talk of BlueFish in terms of the best meal they have eaten. In fact, looking at the BlueFish review ratios it is hard to see why it isn’t higher on the list. Watch this space. Nobody would argue that Tripadvisor provides a perfect rating system, far from it. Despite Tripadvisor’s assurances of working to fix some of the flaws in its algorithm, it does seem that wherever in the world you search, the majority of top restaurants have a relatively small number of reviews, indicating that their ranking does still discriminate against the long established businesses. 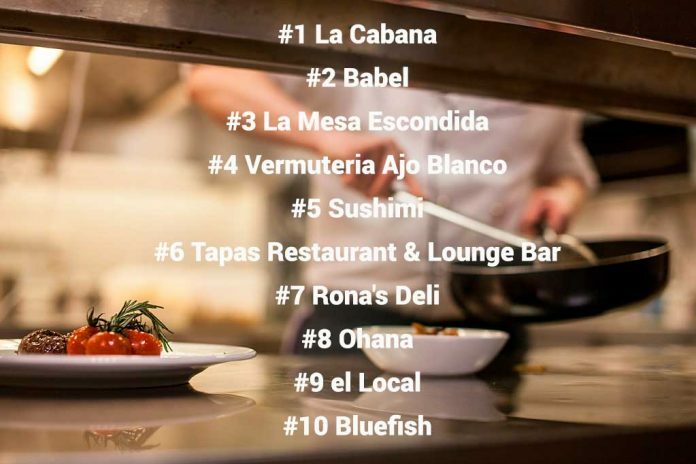 In the case of Ibiza’s top ten this is reflected in that only one entry, San Antonio’s Tapas Restaurant and lounge Bar, has over 1,000 reviews – well done them for making the top spots against the odds. That said, with all its failings accepted, Tripadvisor continues to be a first choice for many people in seeking dining recommendations. Without question the Ibiza top ten has thrown up some excellent and interesting options, including a couple of names completely new to us. 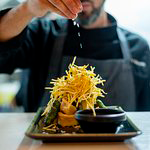 Perhaps the best approach is look to Tripadvisor for inspiration, but not be blinkered to the extent of forgetting all those Ibiza favourites that have been sating our culinary desires since long before Tripadvisor even existed. Our search was at 5pm on 29th March 2019. By nature of the ranking algorithm the positions can change at any time. This link will run the same search for you showing the current positions.